This time of year, many food preservation enthusiasts are hard at work in their kitchens canning, freezing, drying and fermenting. They are scouring their recipe books (USDA approved, of course!) for interesting and delicious ways to take fruits and vegetables at the peak of their freshness and preserve them so they may be enjoyed year-round. For the home food preserver, this hard work will pay off for months to come, and lucky family members and friends will delight in the delicious gifts that are sure to come their way. When we think of preserved food, however, we often conjure up thoughts of sticky, sweet jams and jellies and salty pickles and sauerkraut. The treats from the kitchen of a home food preserver are tasty, but it's not exactly health food, right? Well, you might be surprised to learn that this is not necessarily the case. Typical fermented foods include yogurt, soy sauce, miso, tempeh, buttermilk, pickles and sauerkraut. Fermented foods have been used for centuries in almost every culture for long- term food storage, to flavor foods and in times of food shortages. These foods offer a wide variety of health benefits due to the process of fermentation, which actually increases nutrients such as folic acid, vitamin B12, nicotinic acid, riboflavin, and thiamine. Fermented foods also have "friendly bacteria" or probiotics, that are similar to the beneficial microorganisms found in our gut. More research is needed in this area, but some studies show promising results in treating bowel diseases and stimulating the immune system with probiotics. Additionally, the process of fermentation partially brakes down lactose, making it easier for lactose-intolerant people to consume milk-based products such as yogurt. When food is cooked, dried, frozen and reheated, there is always a loss of nutrients. Vitamins A, C and B are often degraded through the cooking process, however, some cooked vegetables actually supply more cancer-fighting antioxidants than their raw forms. For instance, researchers at Cornell University found that heat from cooking actually increases lycopene content and overall antioxidant activity in tomatoes. Lycopene is a naturally occurring chemical (or "phytochemical") found in tomatoes that decreases risk of cancer and heart disease. So what does this mean, exactly? Is it better to eat our veggies raw or cooked? Well, raw tomatoes are undoubtedly a great source of Vitamin C, but it's also a good idea to eat some canned or cooked tomatoes to benefit from the high levels of lycopene and antioxidant activity. This is true for many other vegetables in our diet, as well. What about all that sugar and salt? Sure, jams and jellies are often made with a good amount of sugar, and we need to use salt to ferment pickles and sauerkraut, but there are ways to preserve food without high amounts of salt or sugar. We can't remove the sodium from fermented pickles or sauerkraut (unless we rinse them before eating), but sodium can be removed from fresh-pack pickles. You can find delicious, low-sodium recipes on the National Center for Home Food Preservation website (http://www.uga.edu/nchfp/how/diet_pick.html). One concern we may have about canned vegetables (whether homemade or store bought) is that they are often high in sodium. Well, the salt in canned food is only used to season the food, it is not necessary for safety. So, if you desire to keep sodium levels low, you can omit the salt when canning and use salt substitutes when you're ready to eat the food. Cooking with garlic and fresh or dried herbs is also great way to add flavor to a low-sodium canned food. There are a variety of fruit spreads that can be made lower in sugar and calories than regular jams and jellies. 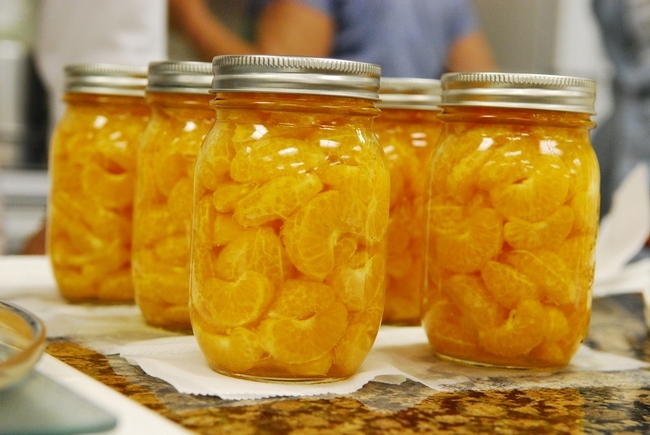 There are also two types of modified pectin that can be used that require less sugar. 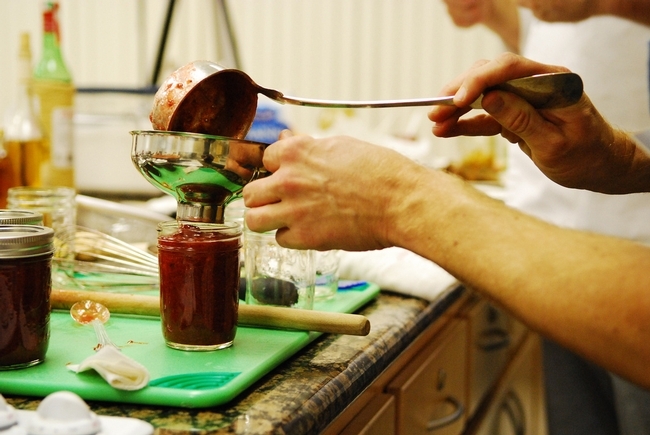 Recipes for low-sugar fruit spreads can be found on the National Center for Home Food Preservation website (http://www.uga.edu/nchfp/how/can7_jam_jelly.html). You can also use gelatin as a thickening agent in low-sugar recipes, but these fruit spreads must be refrigerated and used within a month or so, rather than canned for long-term storage. Fruits can also be canned more healthfully in water or 100% fruit juices, rather than sugary syrups. These fruits must be ripe but firm and prepared as a hot pack. Refer to the USDA Complete Guide to Home Canning for more information. Splenda is the only sugar substitute that can be added to covering liquids before canning fruits. Other sugar substitutes can be added when serving. The next time you enjoy a jar of home canned vegetables or fermented pickles, think cancer- fighting antioxidants and friendly bacteria for your gut. Not only are you consuming produce that was preserved at the peak of its freshness, but you are certainly doing your body some good!